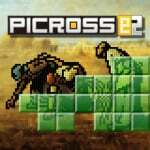 A few months ago, Nintendo released Picross e on the eShop, the first new Picross game in a while and quite an enjoyable - if rather short - package. Thankfully, if you felt a little short-changed you can delve straight back into puzzle-solving with the sequel, Picross e2. Is it anywhere near as good as its predecessor? We're about to find out. It wasn't broken, so they didn't fix it - Picross e2, just like the first game, still uses the classic formula of using a bunch of numbers to reveal a picture, filling in the tiles you think should be filled in, and crossing out those you think should remain empty. As with previous entries in the lineage, you can choose to play with the buttons or with a stylus, so you don't need to move the cursor all around the board. As before, there are technically two different modes; Normal which uses "normal" rules, and Free, which does not notify you of any mistakes, thus not giving you time penalties but making you adopt a more careful approach. These are, just like in Picross e, divided into four categories of puzzles. Easy and Normal are played with Normal rules and contain a total of 75 puzzles, while Free and Extra are played with Free rules and contain another 75. As before, the largest puzzle size is sadly only a measly 15x15 - a far cry from the gigantic puzzles in previous entries. As usual, you can opt to receive one row and column filled in for free at the start of a puzzle, though just like in Picross e, this feature is not available in every fifth puzzle. However, that's not all this time - There's also a new Micross category, which contains 5 more puzzles. That might not seem like a large amount, but these are, as the name implies, Micross puzzles. You start them off by first solving a small, simple puzzle, but after doing so, all the squares you filled in turn out to be individual puzzles as well, essentially meaning that it's one puzzle consisting of over 20 smaller puzzles. 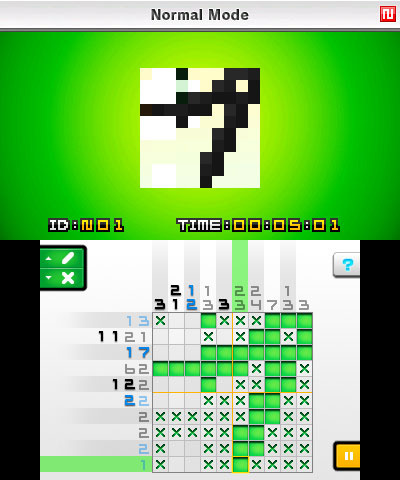 This concept was previously also seen in the Japan-exclusive Picross 2. All the Micross puzzles are of famous paintings, and depending on the location of each tile the individual puzzles can range from difficult to absurdly straightforward - sometimes it's as easy as filling in a single line, with 95% of the board already crossed out due to all the zeroes around the sides. The Normal and Free modes come with a slightly different version of the music from Picross e and the exact same graphics, but Micross thankfully has its own unique music and design, a welcome change of pace. Picross e2 is yet another fun Picross game, but for the most part it simply feels like an expansion pack for the previous title. Of course, there's nothing wrong with that, especially when the core gameplay is so entertaining. If you'd like yet another 155 Picross puzzles to sink your teeth into, look no further, because this is another solid offering. Only 15x15 puzzles? That's disappointing. This is a pretty good purchase if you enjoyed the first one and want more. Assuming you don't use hints (which make it too easy), there's quite a lot of value for money on offer in both e and e2. @BenAV are these better than picross ds? Is this coming to the US ? In terms of content and value for money, Super Mario Picross (SNES) (900 points on Wii's VC) and Picross DS (it's widely available fairly cheaply) are better options. This is still a good game, but could perhaps be considered Picross Lite, given the maximum puzzle size is (like Picross-E) limited to 15*15, and the content can be fully completed in well under 20 hours. The Micross is a good mode for beginners, as the review points out they are very easy. 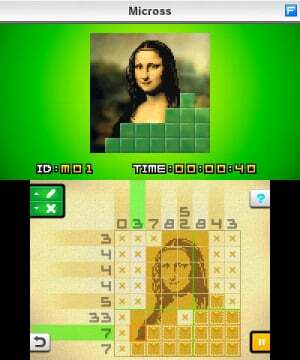 I loved Picross DS and was excited to see this, but damn, only up to 15 x 15 puzzles? So, are they ever gonna release these in America? Hm, never played Picross....no, actually, I've played Picross 3D, that game was awesome! Another vote from me for bringing this to North America. All eShop Picross games will be purchased x2 for my household, as there are two of us here who can't get enough. Its picross. The localization costs would be negligible as there is little text and no voice acting. Its digital as well so costs are lower still. No excuse not to bring this over aside from laziness. I've been pretty disappointed with both these - only having small puzzles limits any real challenge, and the Micross ones were also pretty boring (as the main article says many lf the sub-puzzles are just a line to complete). I'd pay twice the price for a decent version 1.3 with some larger puzzles and more of them. sorry, but i disagree. it should've gotten a 5 at the most, due to laziness. its exactly the same as E, only with different pictures. the menu alone is proof of that. the only new thing is micross, and with only 5 puzzles, not good enough. lack of self-created puzzles and online is pathetic, so is the measly amount of puzzles that go no bigger than 15x15. jupiter needs to step it up or make something other than picross for once. I absolutely love this game. 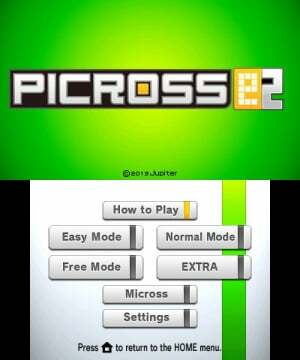 I love Picross in general and Micross is a nice addition. It's still pretty easy though. But a great value for just five Euro's. Nice review, but I was already convinced! I'll download it in a few hours! When is this coming to NA??? Grrr, I've gotten tired of Mario's Picross and Picross 3D. I'm dying for an e-shop picross that's not VC. I loved Color Cross on the DS. Almost as good as Picross DS and Picross 3D. I want this game ported to US.